Overall, the rental process was very easy. The studio at Peak 9 Inn was the perfect size and location for my wife and I on our long weekend ski trip in January 2019. This was our first trip to Breckenridge, and we were looking for ski-in/ski-out and nearby amenities so we would not have to drive anywhere for the 4 nights we were there. 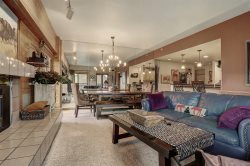 The Village at Breckenridge is an ideal location....great proximity to the Quicksilver lift and to everything downtown Breckenridge has to offer. We appreciate nice accommodations and would definitely recommend the 4611 studio. Our only (minor) complaint is the lack of hangers in the closet (two hangers doesn't cut it when it is cold and you are wearing a lot of layers). The unit I rented was a studio condo in the Village at Breckenridge. Check-in was as simple as picking up keys from the offsite office, a 5 minute walk from the unit. The location was great and just outside one of the mountains major lifts. Everything in the village was a quick walk away. The condo was fully stocked with utensils and cooking supplies and there are ample dining and entertainment options nearby. Staff was helpful and responsive with any questions. Working with the team couldn't have been better. Appreciate the long hours for check in and check out. The village was very close to the lift. Nice for walking. But as such, it can be a little loud especially when folks are arriving in middle of night. Also property lamps were bright and blinds didn't cancel all light from outside. Very nice apartment had everything we need it. The customer service was fine - we didn't have any issues, so everything worked according to contract. The home is absolutely beautiful. The views from the main room are breathtaking. The kitchen had ample supplies to cook and prepare meals. The hot tub works, and was a welcome site after a day on the hills. The beds were comfortable, and the TVs were good sized for sporting events. The wi-fi speed is below average, but everything else was terrific, including the Christmas decorations. We would recommend this home to our friends and family, and certainly plan on staying there again. Interactions with rental company were excellent. Love the easy process. Check in and check out instructions are very simple and clear. Appreciate the follow up after the reservation. As it was advertised. The view from the room overlooking the ski lift exceeded my expectation. The unit was a perfect size for both us. The unit is fully equipped. Everything we need is accessible. Very good experience working with the team. Called a few days before and confirmed we had everything we needed for our stay. Really nice property and very well maintained. Perfect for our group of 12 people. The team was very supportive with any questions and instructions about the property! The only two complaints are related to the lack of an option to pick up and return the condo keys (the first and the last day)at the premise and lack of a ski locker, so we had to carry skis to the room every day. Ski Colorado was a dream to work with. From reserving my property to check in and check out, everything was flawless. Communication was prompt and detailed, anf I very much appreciated the courtesy call to make sure everything was going well (even if I was on the slopes and couldnt answer). Your staff was super friendly and so very helpful. My husband and I enjoyed our stay so much we're already making plans for our next ski trip. We loved that the lifts were practically in our backyard especially after being exhausted from skiing all day. Our studio room was perfect with a breath-taking view. Excellent accommodation. Warm and welcoming. Perfect size for large family gathering. Great location. The team was very easy to work with and responsive. Excellent property and a great location very near the Nordic center. The property was very clean and offered all the amenities plus to make our vacation very relaxing and fun. It was nice to play in the snow all day and come back to relax in a beautiful home. We love this property and plan to return. Very spacious and great for larger parties! The sauna and hot tub were amazing features. This was a very smooth, and easy process. We like to meet our adult sons and friends to celebrate holidays. We search for places where there is enough space for people to spread out. We also look for places that have nice common spaces, where we can hang out, cook together, play games, etc. This property was perfect for both! The apartment is well-appointed and has everything that one could need. The kitchen is well-stocked and the eating area is conducive to sitting around a table and solving the world's problems. The condo is also well-situated in the middle of town. You are in walking distance to lots of happy hours and dinner options. This spot is perfect for relaxing, getting out to play in the snow, and connecting with friends. I highly recommend this spot. All our questions were always answered. The grill we had on the property we rented was out of service and they replaced it with a beautiful new gas grill. They were very helpful and kind. The property was beautiful and the house was clean. It was like being at a hotel. No complaints. There was follow-up even when it wasn't necessary. I was a late check-in, but the instructions were clear and it went off without a hitch. Trails End was clean, convenient and comfortable. Had a minor problem trying to figure out how the fob worked to open the main door to the building, but we eventually figured it all out. The fireplace was a nice touch. The check in process was simple. We called one time after hours when power was lost to the entire building and received a very quick response. The power loss was on the energy company and was restored after a couple hours. The unit was very clean, spacious, and exactly as presented. We enjoyed being in a corner unit that added to the great views. Underground parking, an elevator, and a tunnel providing quick access to downtown and the gondola are great pluses to the property. The Mountain Thunder Lodge is a cool building with a location well suited to any vacation in Breckenridge where you want to feel at home.